You asked and we listened. Work Orders have become more powerful than ever with the ability to manage multi-level and batch work orders with the click of a button. Work orders are an essential communications part of manufacturing businesses. They inform your operations team that certain products are needed and give the green light to production. Megaventory Work Orders, though, are so versatile that can also be used by non-manufacturing businesses that need to track processes like unboxing, repurposing product’s parts into other products, maintaining and repairing damaged inventory, and many other tasks. With the new upgrade, these tasks become much easier to perform, saving you valuable time and preventing duplication of effort. So, how the updated work orders can help you? Let’s imagine the story of Carol who is creating cakes for her bakery. She buys flour and other ingredients in large sacks that come in different sizes and weights but the ingredients in her recipes are in grams or ounces. How can she measure what she has available for production without doing a mathematical equation every time? With Megaventory, it’s a piece of cake (no pun intended). First of all, Carol needs to create a Work Order that will turn the product “5kg sack of flour” to the product “1g of flour”. In that way, the first “material” will create 5,000 finished products. And she will continue to do so for the other ingredients. The next work order will be to turn the finished products she just created to another finished product, the “cake”. By creating a Bill of Materials, which is basically the recipe that guides Carol on what ingredients to use and in what quantity, she can easily do this Work Order again and again. With the new upgrade, you can do all the above actions automatically with the hit of a button. As shown in the following screenshot, when you click on the gear icon next to the work order number, a list of available options pops up. 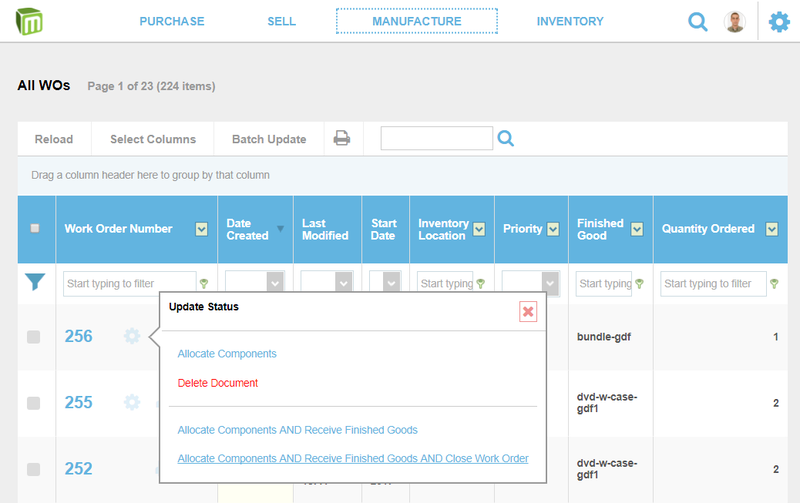 If production has moved faster than how often you update your Megaventory account and ordered products are already finished you can now click on Allocate Components AND Receive Finished Goods or Allocate Components AND Receive Finished Goods AND Close Work Order. This is also helpful if you are unboxing items to sell them individually and the time between the creation of the work order and its completion is seconds. 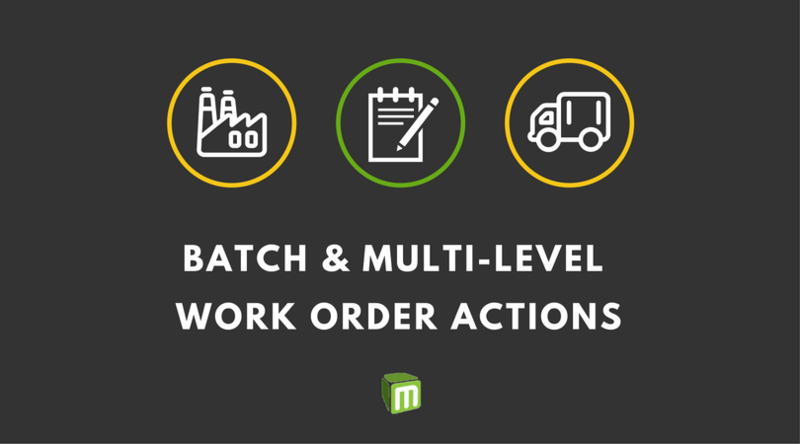 On top of being able to perform multiple actions with one click, the user of Megaventory is now able to simultaneously update batch Work Orders. 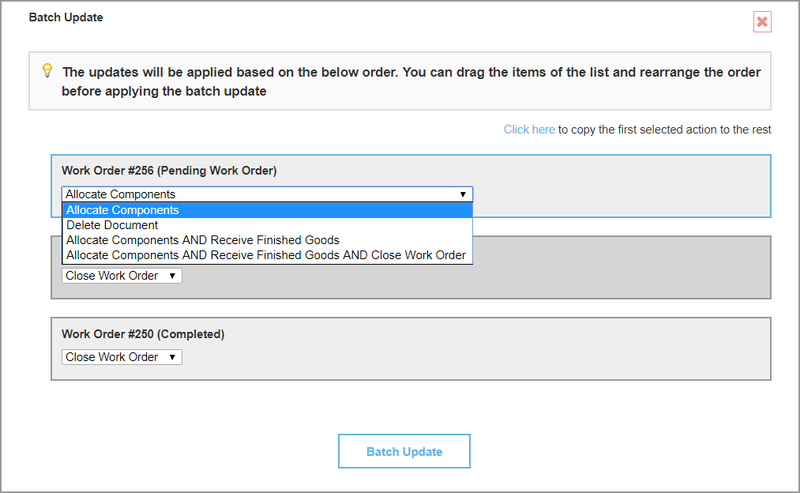 To do this, just select the orders you want to update and then click on Batch Update. After that, the following a pop-up window will show up and prompt you to select the actions you want to perform. While here, it is also possible to rearrange the order in which the following orders will be completed. Every one of the above actions will have an immediate effect on your inventory. If you receive the finished goods, this will automatically update the available stock of the related products and allow you to fulfill a pending sales order. If you select to allocate components, these will not be available to be used in other work orders. In other words, what the batch update does is that the appropriate action will be applied to all the selected work orders or if there is not enough stock, it will stop and inform you so. Back to the story of Carol, our baker can use this advanced feature to simultaneously unbox all of the ingredients needed and create her cake. The above functionality can also help businesses that manufacture more complex products such machines, computers, and so on, where calculating mistakes can cause serious delays and problems in production. And since there is no theoretical limit to the levels of manufacturing you can include the production flows that can be designed can be very detailed. But why use a work order software? If you are not using an ERP system already, you may think that you are good with your pen and paper, or spreadsheets. Such techniques can result in production mistakes and the truth is that nothing is worse than telling a customer that their order will be delayed. Such incidents can jeopardize your chances of acquiring regular customers that do repeating sales from you. At the same time, the more you delay finishing an order, the more inventory you need to keep in your warehouse or factory, which actually costs you money. An inventory management system will help automate your work orders so that you can meet the demands of your customer more easily. 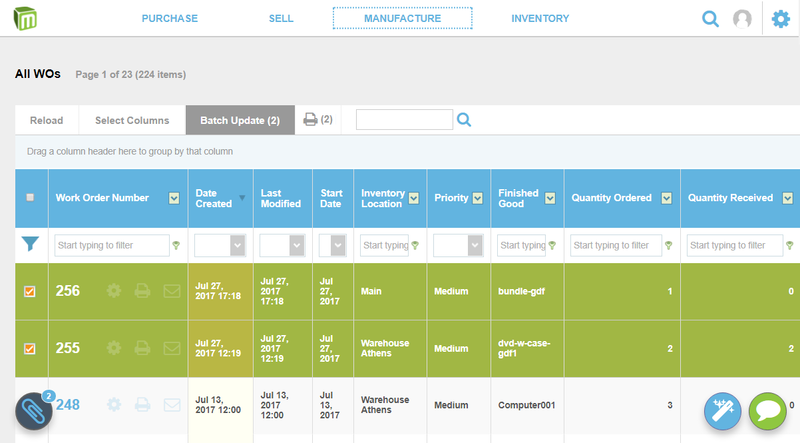 It will help you know what you have in stock so you don’t run out of inventory when you’re making products. If you do run out, the multilevel manufacturing module will allow you to identify which manufacturing step can't go ahead and you need to buy stock. And don't forget that with Megaventory you can create purchase orders in just a few clicks! Using Megaventory for managing your manufacturing work is much more affordable than other online software solutions in the ERP industry. It’s a great fit for small and midsize businesses because of its price and flexible feature set. With this added feature? Sign up for a free trial of Megaventory today!